The industry's newest high-end automatic L-sealer that's packed with features but low on price. This efficient, dependable, top-quality system is designed especially for high-speed applications. It incorporates the very latest in engineering excellence to offer high-volume, continuous operations; minimized downtime; and packaging speeds of up to 25 packages per minute. The nine dot logo and OPTI® are trademarks or registered trademarks of Sealed Air Corporation (US). 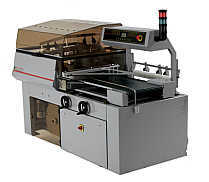 MOST ECONOMICALLY PRICED AUTOMATIC L-SEALER IN THE MARKET!! !